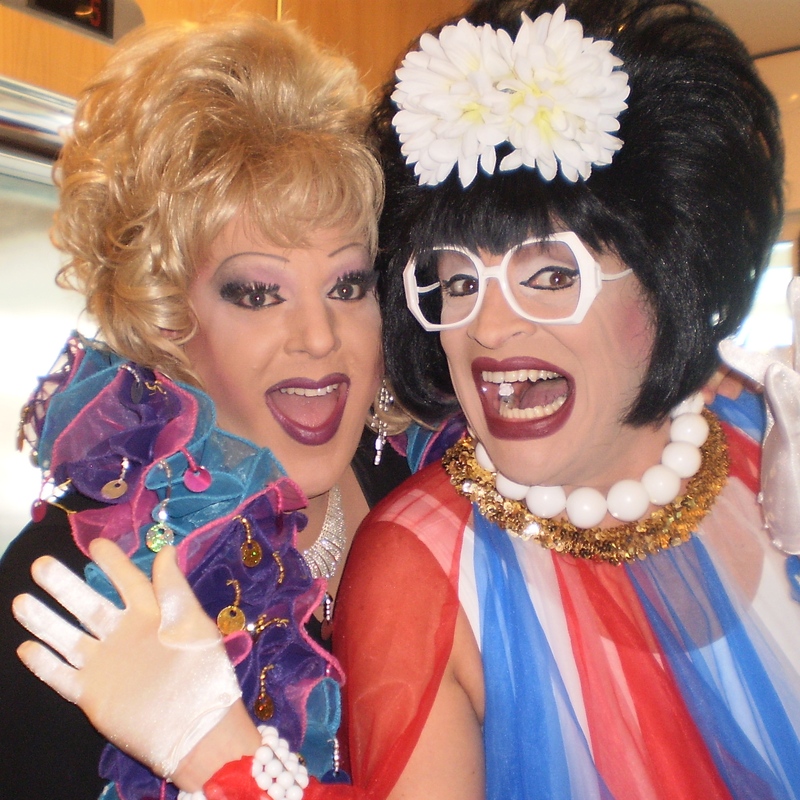 I am taking my campaign “Red Lips to the White House” on the road this summer to Ptown, Ogunquit, and Rehoboth Beach, eventually heading west this fall to Palm Springs! It’s going very well and I’m finding people are wanting another choice in the presidential race. I’ve already taped one of those fancy films about my life, which I’ll be putting on AM radio soon. Next on my list is to find a vice president! But before I pick a candidate, I’m trying to find out what the vice president does. It seems to be a low profile job and I think the VP needs to find their own housing in Washington DC. At any rate, I’m hoping to find someone who can help me move my trailer to a grassy spot behind the White House! I think driving my home from Richfield to Washington will be easier than boxing everything up! All in all, this is getting expensive and you know most of the time I’m paid in drink tickets. So I have lovely items I’m selling at my shows and a fashionable Ptown retailer, Urban Man Made! Among the treasures are bobble heads, CDs, magnets and coasters. See my calendar for campaign stops! Getting New Advice for the New Year! Happy New Year to all my darling prairie dogs! It’s new, new, new here in Richfield! It’s a new year with a new show in new places! I hope you’ll be joining me as I motor across the country this winter and spring, eventually landing in Ptown for the summer! My show, “Red Lips to the White House” is a bit political in nature. So I gave a jingle to a friend in Washington DC and he offered some advice about how to make the show interesting without taking sides. I find it so off-putting when people always want their way and see no other side to the problems we are facing today. Anyway, I’ll be heading out the door of my trailer soon and want to see all of you in Atlanta, New York, Ft. Lauderdale and of course, Atlantis Events, as I bring my message of hope & beauty to the world! Hi Dee Ho to all my darling prairie dogs! 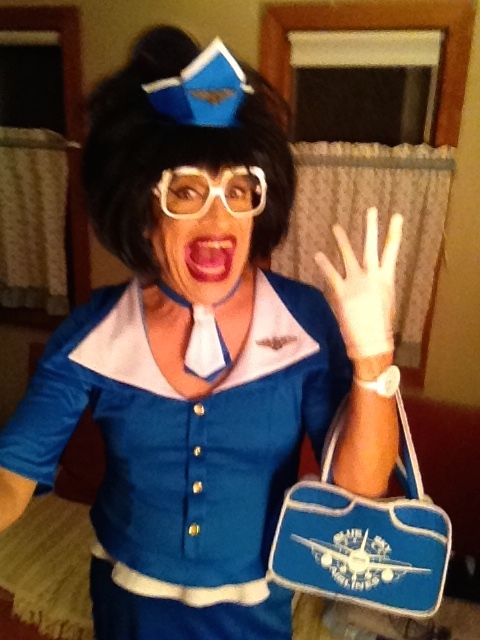 As you can see, I’m ready to get back on the road after a lovely season in Ptown. All of you who visited me this summer know that the town was filled to the brim with fun crowds, amazing entertainers and beautiful weather! I also made many appearances at the Blue Moon in Rehoboth Beach and the Cutting Room in NYC. One of the many thrills this summer was sharing my stage with Broadway legends Barbara Cook and Shirley Jones, along with Jennifer Holiday and Billy Porter. Being a popular and successful bingo gal, I know how challenging life-on-the-road can be, so I did what I could to help and left my make-up drawer open. Interesting that only Billy took advantage of that. I’m not sure what he used, but I think he looked better than ever under those exceptionally bright Ptown lights! But enough of the past! I need to prepare for my future dates in Chicago, San Diego, and my Atlantis Events cruise and resort week in Puerto Vallarta. I’ll also be launching my holiday show, “Christmas Cone of Silence” at the Illusion Theater in Minneapolis the first 3 weekends of December. Tickets are already on sale. And I make my annual holiday trip to Rehoboth Beach and Ptown right after Christmas for special shows. So keep your eyes open and I hope to see you at one of these exciting events! Outstanding Citizen of the Year! Richfield Human Rights Commission: (L-R) Vice Chair Deborah Eng, Sara Gumke, RHS student representative Swopnil Shrestha, Jeff Wright, and HRC Chair Mark Westergaard. 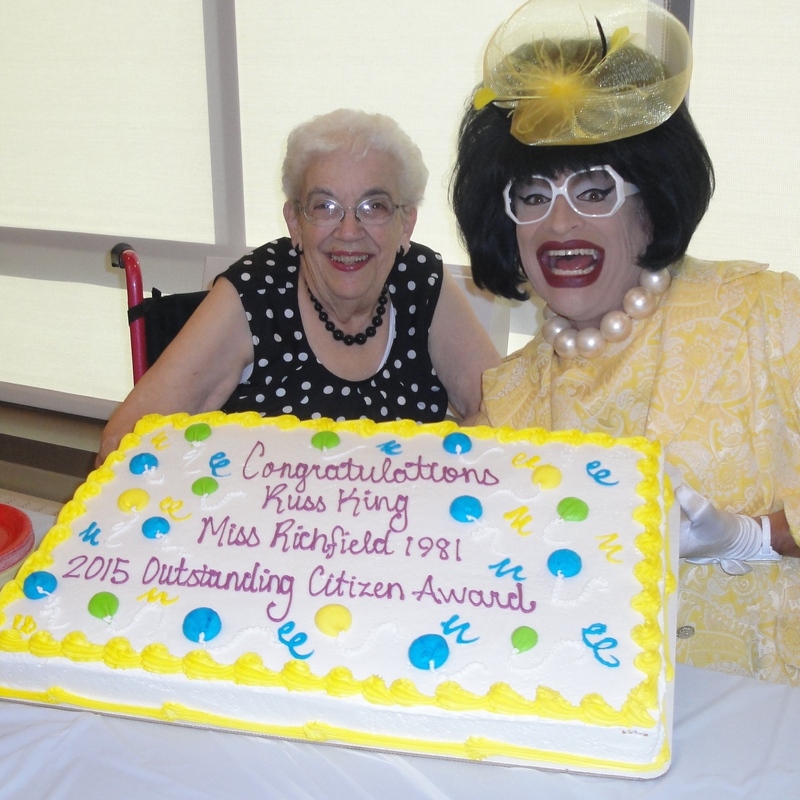 I am so very proud of my hometown – Richfield, MN! I motored back to the Land of Lakes last week to receive the “2015 Gene & Mary Jacobsen Outstanding Citizen Award”! Honored and thrilled couldn’t begin to express my feelings for my home, sweet, home! My family has a long history in Richfield, dating back to my grandfather carrying mail at a time when they had to deliver it twice a day! Then things got more interesting when my mother’s family moved directly across the street from my dad’s family. The two dated, which was easy because my father could back down his driveway, across the street, and into my mom’s driveway to pick her up for a night on the town. After marrying in 1951 and completing military service, the two bought a home in Richfield and raised a family of four. Although my father’s been gone since December of 2000, my mom was able to be there on Tuesday night for the festivities and award ceremony. I was honored at a beautiful reception, which was attended by many dear friends. My mom Barb, me and the cake! But the greatest honor was to be included in the Richfield City Council Meeting at 7 pm. Such kind words of introduction were shared by Council Member Edwina Garcia, a great leader in the community of many years & role model for all Richfield gals! Then more kind words and a proclamation from Richfield Human Rights Commission Chair Mark Westergaard. Then the presentation of a lovely plaque given by Kim Jacobsen, son of Gene & Mary, the namesake of the award. You many think that this is a brave step for this community, but it is only one of many wonderful commitments to diversity! 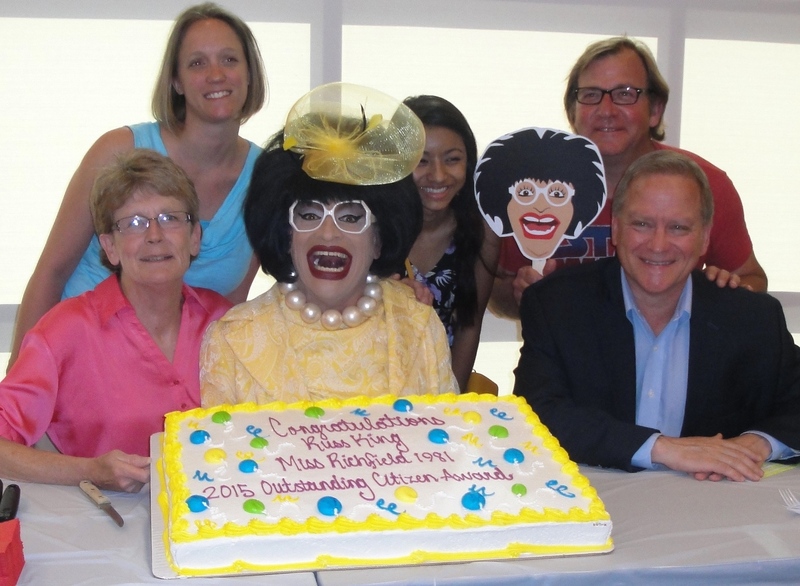 Many years ago Richfield was one of the first cities to give domestic partnership rights to employees and more recently, the city council committed to the “Vote NO” campaign that would have restricted gay marriage. Here is one more reason to love Richfield! Don’t Worry, You’re Under the Cone! If you squint, you can see summer just down the road. So I’m pulling giant rubber tubs out from under my trailer, where I store my sensational seasonal frocks. I need to work fast because in a few weeks I’ll be heading to the bus depot and motoring east for Provincetown, Rehoboth Beach, Ogunquit and NYC!!! 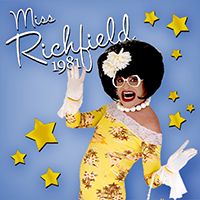 My Ptown show at the Crown & Anchor will kick off in one month – Sat, May 23rd. That’ll be followed by my first Rehoboth Beach Idol at the Blue Moon in Rehoboth Beach, DE, Wed, May 27th.. Then a long anticipated return to NYC on Thurs & Fri, June 4 & 5 at the Cutting Room. And just after July 4th I’ll be heading north to Maine Street in Ogunquit. Whew, I’ll be getting into the Mile Long Club on the Greyhound for sure this summer! 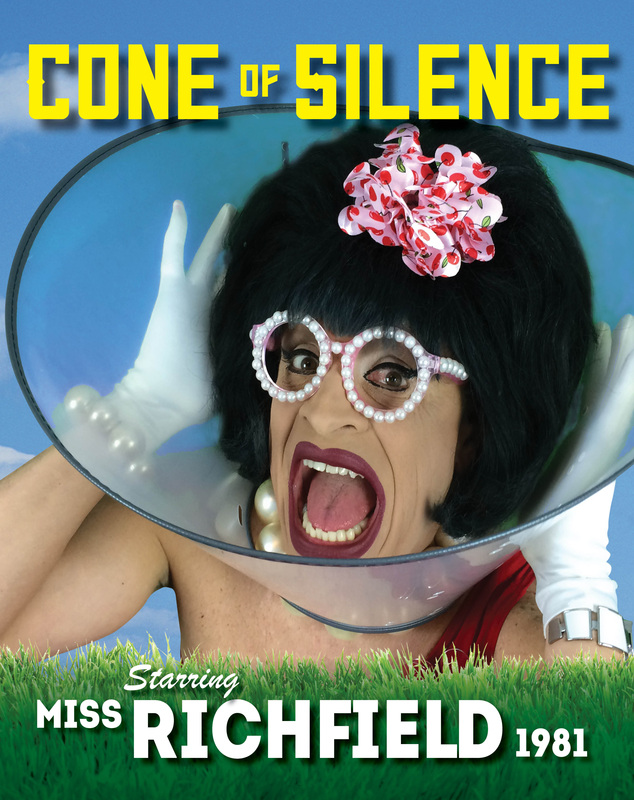 “Cone of Silence” is my all-new production that will captivate audiences this season. It’s another triumph that includes new videos, new music, new costumes and new activities for a theatrical experience that explores difficult topics. I’ve heard that we’re are only as sick as our secrets, so I decided to find out what people are hiding and talk about it. So try not to share your troubles until you come to see my show. I think it’s a lot more fun to talk about secret problems in front of a crowd. It is not a hi-dee-ho day! No, my darling prairie dogs, these are sad days in Richfield, as I say farewell to my Cashetta – a fellow performer, wonderful co-worker and sweet, dear girlfriend! She passed away so suddenly in Puerto Vallarta and now I find it so difficult to write memories and go through photos, because it makes it so real and so final! Cashetta and I first met while we were both working in Provincetown, and immediately we knew we’d been separated at birth. As I recall, we sat at the Wave Bar at the Crown and began to make each other laugh, often at the expense of others! And so continued a long and hilarious friendship that spanned many shows, at many venues, in many cities across the country. We also traveled together internationally, the longest trip being a 21-day Atlantis Events cruise in Asia. While there we got into a shoving match with angry tuk tuk drivers in Shanghai, nearly lost our lives with a drunk cabby in Bangkok, and watched a guest toss his cookies at the fish market in Busan, South Korea. Most tourists would remember a lovely temple or natural wonder, but Cashetta and I would recall such hilarious moments and howl with laughter – even many years later. Through the years our paths continued to cross, most recently at the beloved Blue Moon in Rehoboth Beach, DE. It was so exciting to see my dear friend make such a beautiful home for herself, filled with the love of Tim and Randy and the gang at the Moon. In just a few short years, Cashetta became a fixture and favorite with both vacationers and local folks who loved her personality and antics on and off stage, including regular appearances on the beach during the afternoons. Such dedication and fun was her hallmark. What a sport! But it wasn’t all laughs with Cashetta and I. There were the serious talks about shows that didn’t go well, pets that died, and the hassles of food for her and alcohol for me! Dark, difficult times made a bit brighter and lighter when shared with someone who knows your heart. So my last Cashetta memories couldn’t be more appropriate, as my dear friend and I spent time together in Puerto Vallarta attending each other’s shows and taking the city bus to shop at Wal-Mart. Fortunately the day before I left, we grabbed a last-minute lunch. But our normal 2-hour gabfest was cut short because Cashetta had to hang up her show posters, which were misprinted. So the last vision I have is the two of us giggling at this most obvious and hilarious mistake, knowing it was going to be posted all over town! What a wonderful last memory. I know she’d think so too!